Why does homework seem to take longer on the computer? And is your child actually doing schoolwork, or just playing games and group texting? We as parents need to help our kids manage the new homework landscape – and it helps to go in with a strategy. Distraction is a real issue with kids and tech. Having a plan can help mitigate the shortcomings of tech and help your kids find balance. When I speak at schools in communities across the country, parents approach me with their concerns. In every community, technology as a distraction comes up as one of the most frequent—and urgent—issues that worry parents. Recent data from iKeepSafe suggest that parents are right to be concerned, with 28% of teens reporting that their digital engagement interferes with schoolwork. Even outside the classroom, 44% of tweens admit that their digital pursuits take them away from other things they are doing, and 17% of tweens say that their digital engagement causes problems in relationships with friends and family. Click here for rest of the iKeepSafe study. Adults are hardly exempt from the distraction issue (myself included! ), with 14% of adults acknowledging that they need to spend less time with technology. If this issue is challenging for adults, imagine how difficult it is for kids. Teens and tweens are in need of mentorship to help them navigate these challenges. Let’s face it, most of us aren’t ready to unplug completely as our digital engagement bring about significant advantages. We shouldn’t expect that our kids are, either. Let’s look at the issue more deeply. This data is helpful as it breaks down some different scenarios for distraction/disruption. One of the biggest reveals, later in the study is how much teens and tweens online engagement can interfere with sleep. The is a huge issue, and can masquerade as distraction, as focus is difficult to achieve when you are exhausted! Two Tech Attitudes – Which One Are You? 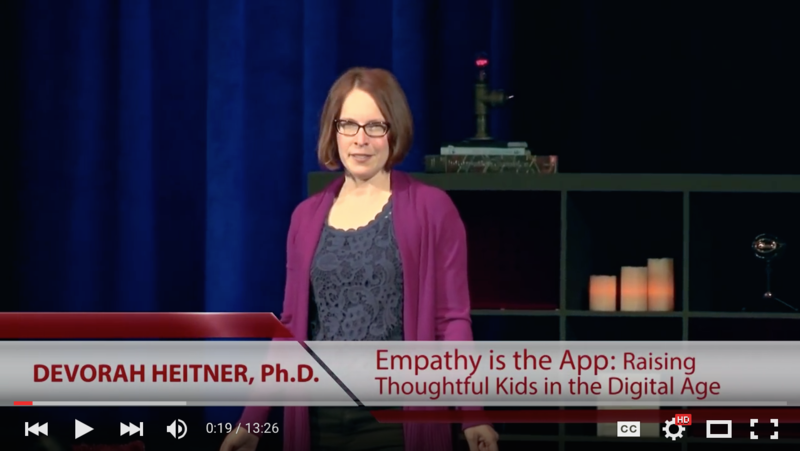 As I describe in Screenwise: Helping Kids Thrive (and Survive) in Their Digital World, the research on kids and distraction falls into two broad categories: The Optimists and The Cautionists. The Optimists. Techno-optimists believe our minds are getting stronger because of digital technology. Freed from having to remember a ton of facts, we can create and link ideas together in new and interesting ways. Cathy Davidson argues that “monotasking” is not compatible with how our brains work. The Cautionists. Techno-cautionists believe that technology is a distraction – that we are all in “The Shallows,” skimming and scanning and not truly reading. Indeed, before we all jump into eTextbooks, we should look at some of the evidence that format matters. While there’s more research to be done, there are studies like this one that suggest that we retain information better when it’s in paper form rather than digital form. One question to keep in mind: Is this true only for people who already have a history of learning from paper texts? Or are there properties of printed text that affect memory—such as the physicality of turning a page and knowing where you are in a book? And how is this different for digital natives—our kids? Annie Murphy Paul says (in research summarized in Slate in 2013) that groups of college students doing important homework checked their phones quite frequently. We seek out breaks in our work and the mental work of toggling back and forth is where we risk sacrificing our best abilities. It seems like only a few seconds of interruption, but it takes us a while to re-engage and get back into the flow. This “dislocation” is a problem as we may get fatigued from the effort of repeatedly bringing ours minds back to a task. Thus, one hour of homework can take 2-3 hours, yet be more exhausting—but the effort is not from the work itself, but the work of constantly re-focusing. What this may suggest, is that for major work (a longer paper or a serious assignment), your teen or tween student should print out her drafts and proofread them on paper. Editing on paper may be better for many of us. Paperless sounds great and is very ecologically desirable, but many of us need to proofread our most important work on paper. Let’s dive a little deeper into parents’ biggest concern about distraction—homework. Does this scene sound familiar? Your child goes up to her room to complete her homework—perhaps on a school-issued iPad. Three hours later, she isn’t finished. Was she perhaps iChatting or Facetiming with her friends? Perhaps it started out about the homework, but then she got pulled into other topics. Was she listening to music and “had” to make a new playlist? Did she get distracted by someone’s post on Instagram and feel she was missing out on a social “hangout” that very instant? Or was she just “old school” daydreaming and not focusing? Most kids in elementary and middle school shouldn’t have 3-4 hours of homework. The homework epidemic is a topic for a whole different book, but do check with your child’s teacher for guidelines about how much time they expect homework to take. If it’s taking way too long (or not long enough), it could be an indicator that there’s an underlying problem. Many kids need to unplug for homework. Again, check with your child’s teacher. Not all homework requires online time, so offline time (or even turning off your home wifi) during “home study hall” could be an amazingly effective tactic. Imagine the conversations with your spouse and the dishes that would get done if you couldn’t check your email right after dinner! No double screening. Many students I’ve spoken to say their parents have rules about no double screening, but it can be a huge help. Though it requires some will power, put the other device away. Even if homework requires a tablet, for instance—stick to one device so you can focus. Use tech to fight tech. Some kids will appreciate and enjoy “distraction blockers” like Leechblock and Freedom. While this won’t solve the problem on its own, it can help! As I type this post, I am blocking social media myself. My friends’ babies are cute and breaking news is exciting, but I need to focus. Turn off the tech. Many parents find that simply turning off their home wifi really helps kids get their work done. Again, the Internet and connectivity is only a small part of most kids’ homework. Sure, they may be expected to be in an interactive space with classmates to post a comment, but that is likely only a tiny portion of their homework. Even a blog post as an assignment can be written offline and posted later. Start unplugged to get plugged. If your kids say, “but I need to (collaborate with my friends, be online, use the Internet, etc.) to do my homework,” have them complete all the non-Internet homework first and then have them do the plugged-in homework. Impose a time limit or be present yourself so that they know that they need to finish. Hope that you find these suggestions to be helpful. Our devices add a lot to our lives—both positive and negative. Digital Citizenship is about learning how to harness the positives and minimize the negatives. Distraction is not just about the devices, but how we use them. If you can get at the root cause of distraction, you will be in a much better position to mentor your kids on to fight through it and get their homework done! Please share your most positive experiences with navigating distraction and any challenges in the comments! Do you have any best practices to share?